We have a strong and robust infrastructure based at Mumbai, Maharashtra. 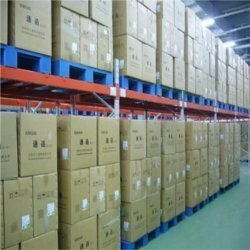 The warehouse is constructed over a wide area which aids us to offer a wide range of product-line. We have well equipped our infrastructure with the advanced machines and equipments, which enables us to carry out the production process in a streamlined manner. Beside this, we have a team of professionals who work with dedication to offer the qualitative range of products. The team appointed by us has a enriched experience and knowledge in their respective domain. Owing to our well established, we are able to offer a superior range which enabled us to garner a huge clientele across the nation. The warehousing plays an essential role in the development of any organization. It sprawls over a wide area, which enables us to store our product-line in a well orderly manner. This unit is handled by a team of immense expertise, which sustain all the record of all incoming and outgoing products. Our skilled and qualified team keeps a regular check on the unit to ensure that the warehouse is protected from the dust, rain and fire. We have also empowered by the fire safety equipments which make us ahead from our competitors. We are also employed a separate packaging unit, which make use of supreme quality packaging material to ensure the safety and quality. The firm offer customized packaging options to our esteemed clients as per the specific requirement and demand.